It is the biggest challenge we have for people entering our DVRT Ultimate Sandbag Training. That is, getting people to think differently how they are going to use and lift the Ultimate Sandbag. Trust me, I get it, heck I did it! When I first built my first homemade sandbag I tried to replicate many barbell movements. What I found was that the best tool for doing barbell movements was, well, a barbell! I started to think about it, if sandbags were a good substitute they would have been a lot more popular, but that just isn’t the case. That’s why I tell our coaches all the time, people don’t want “sandbag training”, they want the solutions we create by the ways we think differently about how to lift them. 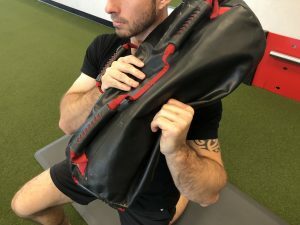 In order to get the benefits of what DVRT Ultimate Sandbag Training has to offer, you have to optimize the unique features that the implement offers. How so? 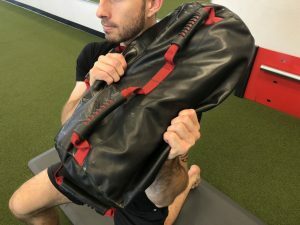 One of the big ways is the very different way we can hold and move the Ultimate Sandbag to stimulate so many functional fitness outcomes at once. A great example is how we use our Arc Press in DVRT Ultimate Sandbag Training. DVRT Master, Annmarie Licatese, shows how this is simple looking Ultimate Sandbag Training exercise accomplishes so many functional fitness goals. At first glance, people think, “cool new pressing exercise.” They don’t go deeper to what we are actually trying to achieve with the movement. It is THEN that you start to understand the right tool is really important. As I often say, the best tool for kettlebell swings.. you got it, is a kettlebell! The Arc Press is such a fantastic exercise because it allows us to teach some really important concepts for the shoulder. For one, we get to be in a neutral grip position for the arm which works MUCH better for most people. For a lot of people when they turn the elbow out which is called external rotation of the shoulder. So, right off the bat, we are having a major win with for most people in pressing more successfully overhead. Of course that is just the beginning of what we REALLY get out of DVRT Ultimate Sandbag Training. One of the MOST unique aspects is the lateral stress we get during the Arc Press. We always talk in DVRT Ultimate Sandbag Training about the fact we move in three planes of motion and a big one being side to side. That is why we place such an emphasis on exercises like side planks. Think of the Arc Press as an upright side plank! Which is ALSO why we often start in a half kneeling position. Being in half kneeling really amplifies the side to side strength training we get from the Arc Press because the body must create stability into the ground. So, we learn how the core is a major part of saving your shoulders! Here DVRT Master, Sean Lettero, shows how most people casually holds the Ultimate Sandbag and becomes an awkward shoulder movement. We also don’t just casually hold the Ultimate Sandbag, but we actively try to “pull apart” the Ultimate Sandbag. When you do so, you engage the grip connection to the shoulder, but just as importantly, you connect the lats. Learning to use the lats and core along wit the feet allows us to create great stability of the shoulder and so often we take people that can’t go overhead into nailing it with great confidence and no pain! Here Sean is pulling apart the USB and creating tension down into the lats and core. The little things that transform an exercise! The best of DVRT Ultimate Sandbag Training is that we have so many levels of the movement. From foundational to really complex. That allows you to accomplish so much with so little. We believe purpose and intent should lead to greater success than tons of equipment. DVRT Master, Greg Perlaki, shows how we build layers of core movement with the half kneeling Arc Press and Leg Threading. It is the “little things” that make DVRT Ultimate Sandbag Training exercises so powerful and give us the results that make us push forward in understanding what true functional fitness is all about! Our Power Ultimate Sandbag is our favorite to perform many of these Arc Press variations. Don’t miss grabbing it for 25% off any our Body Armor program for FREE when you use coupon code “save25” HERE.